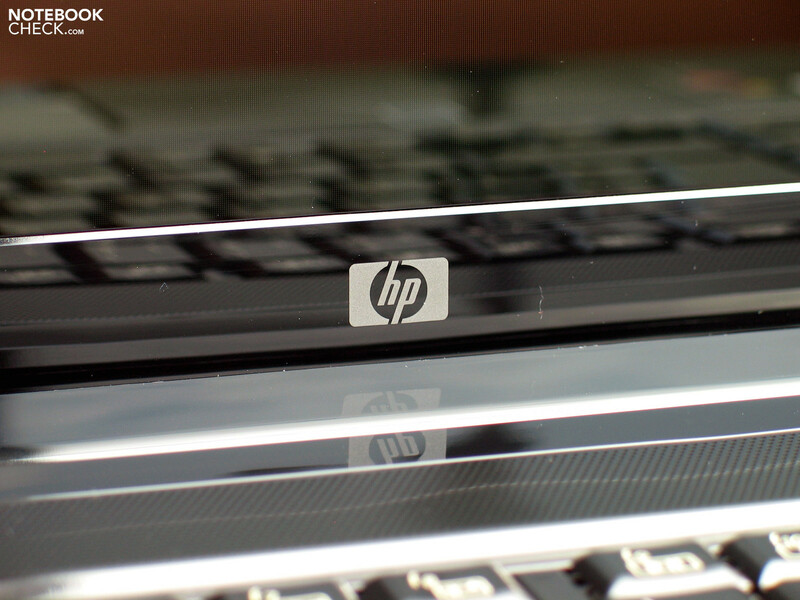 The dv6 series by the American manufacturer Hewlett-Packard scores with an exciting price/performance-ratio. 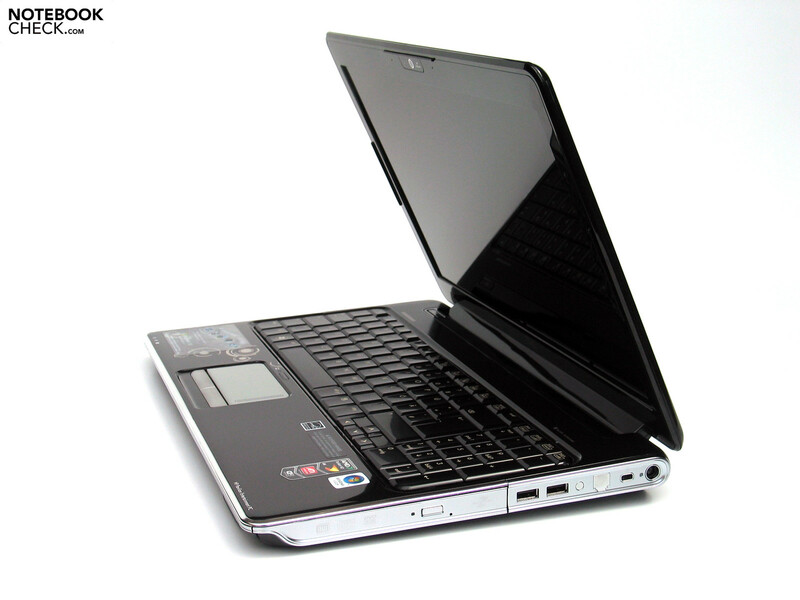 All the series' models are positioned well below the mark of 1000 Euros, and there even is one version by all means suited for gaming: the model dv6-1140eg, equipped with an ATI 4650 graphics card. Also an obligation for multimedia users: a 15.6" HD display in the 16:9 format. 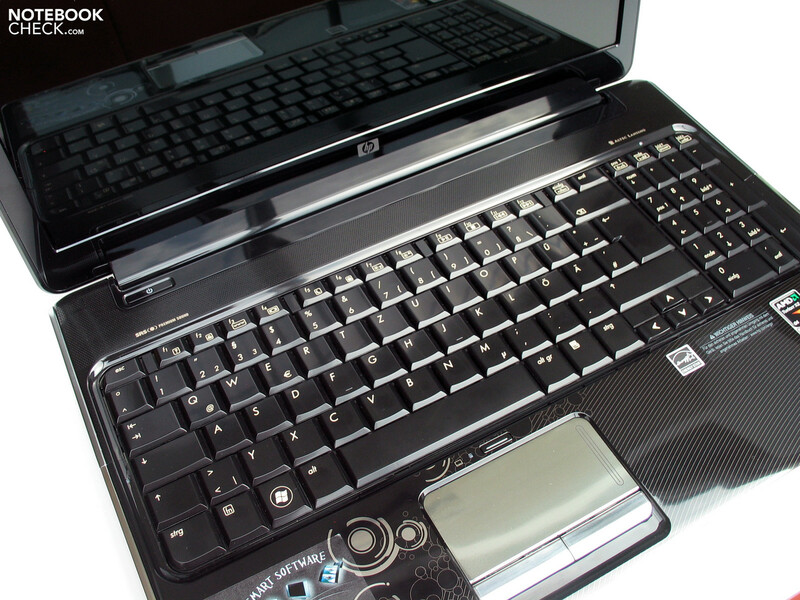 The dv6-1099eg at hand quasi defines the currently most low-priced beginner's variant of the dv6 series by HP. 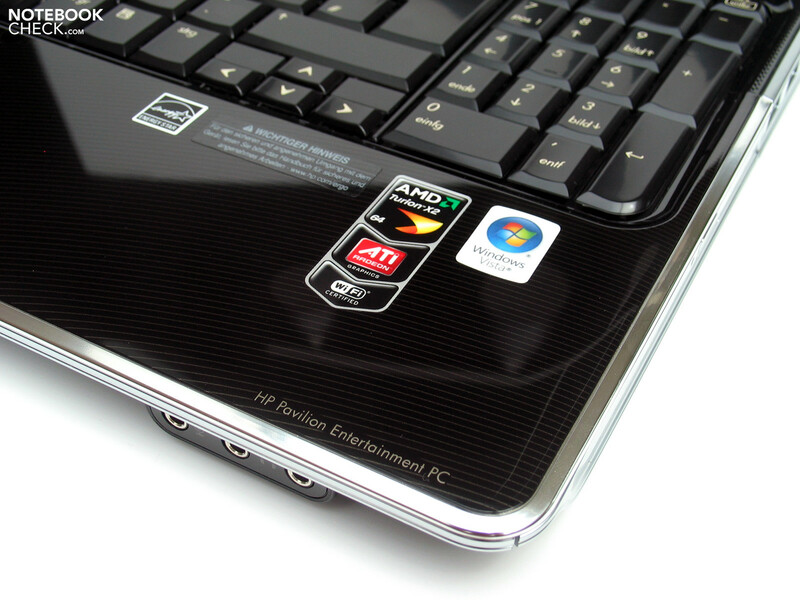 Equipped with a Turion X2 CPU and an ATI 4530 graphics card, the notebook primarily satisfies basic needs such as video and music playback, but is also suited for computer games in a limited way, at least at reduced resolution and level of detail. If you should have somewhat higher needs when it comes to computer games, getting one of the better equipped (and in principle structurally identical), but several hundred Euros more expensive models 1160eg or 1140eg should be considered. Both are equipped with an ATI Mobility Radeon HD 4650 graphics card (the latter one even has an Intel CPU, which has to be placed above the AMD competition in terms of performance), which positions itself as a serious competitor to the current 9600M GT middle class graphics adapter by Nvidia - it can even predominantly leave it behind. 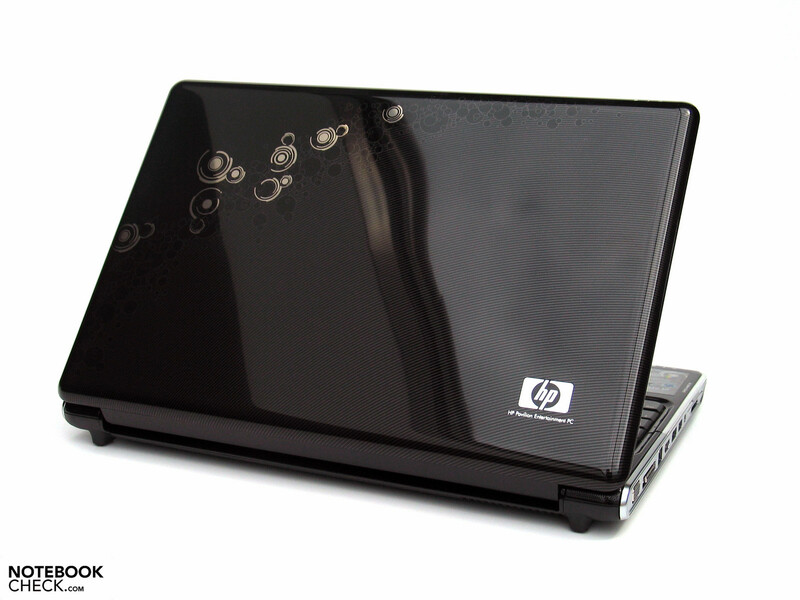 The dv6 series' case is very evocative of the just reviewed HDX16 model by HP in terms of looks. Apart from the different lacquering, it really might be a matter of partly identical component parts - last but not least also due to the identical form factor. An essential change (from a constructive point of view as well) attracts attention to the kind of display featured. This has also been implemeted as a high-gloss panel, although not in Edge-to-Edge design as in the HDX16, but with a conventional display frame - which albeit comes in proper style with a high-gloss look. Almost all surfaces were finished in this manner, by the way. The only exception is the case trough, which shows "naked" black plastic. The lacquer surfaces are to be described as sticky and not very convincing in terms of haptic. The look however can indeed profit from the depicted ornaments. These are placed pretty effectually and are found primarily on the display's lid, as well as in the area of the palm rest. 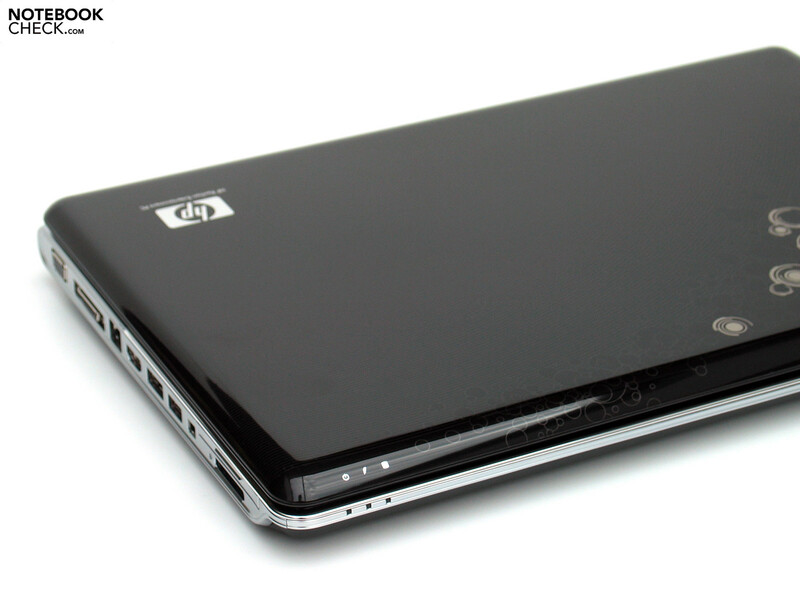 The build quality has to be described as good in every respect, similar to the HDX16. Futhermore, we could not find the salient, uneven transition between component parts observed for the HDX16 in the reviewed dv6. 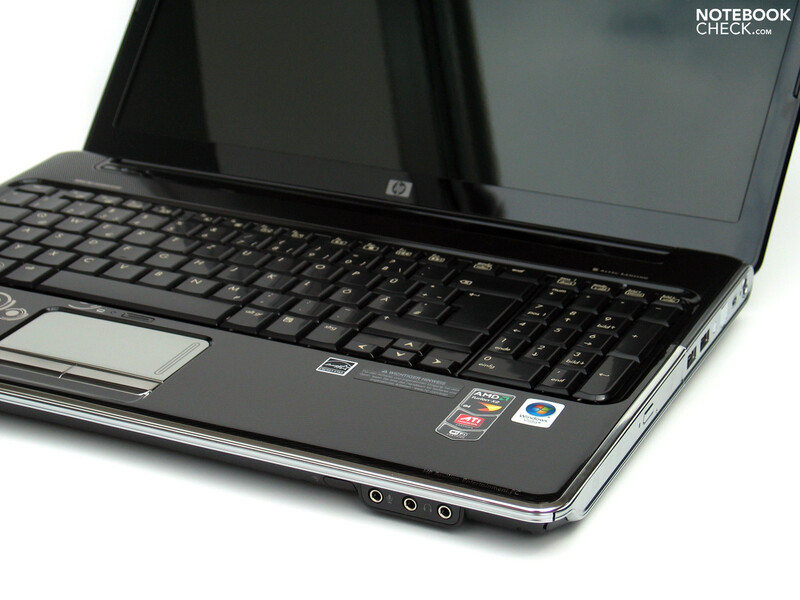 Therefore, this likely was a nonrecurring slip of the HDX16's quality control. Minor deformations are possible on the case when pressure is applied, especially in the area of the optical drive. Sporadic creaking sounds became noticeable when tampering with the device, i.e. adjusting the display's pitch. 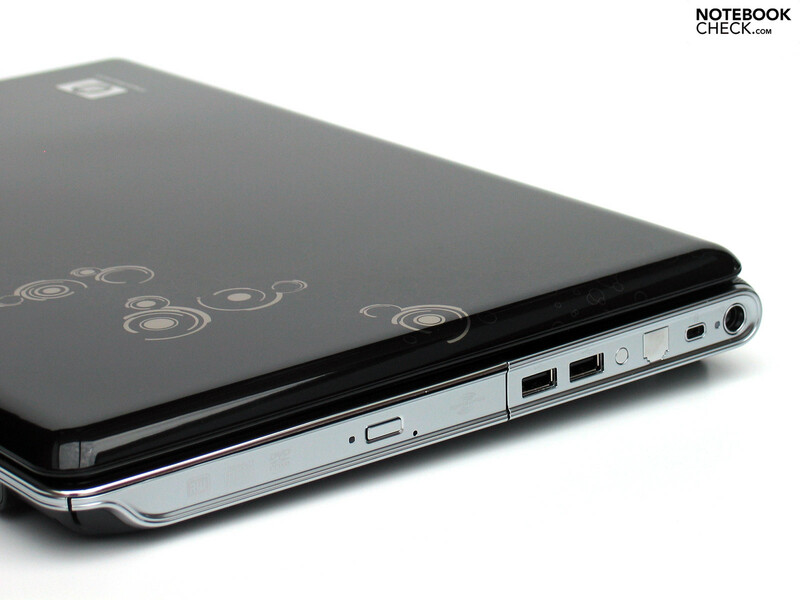 The ports offered are almost identical to those of the HDX16. The card reader, for example, has been positioned differently, it is now to be found on the left side's edge, below the ExpressCard slot. 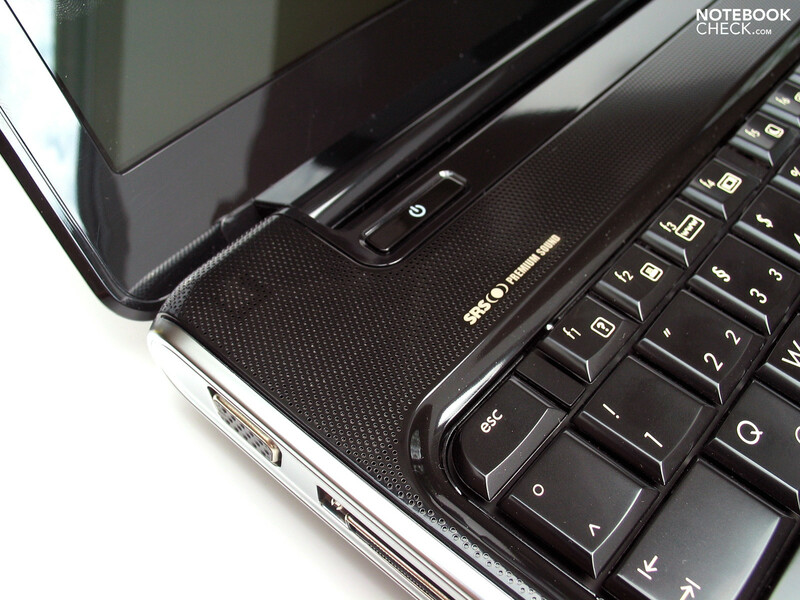 On the right side, the optical drive moves over completely to the front, which pushes the USB port (located here on the HDX16) to the back area. 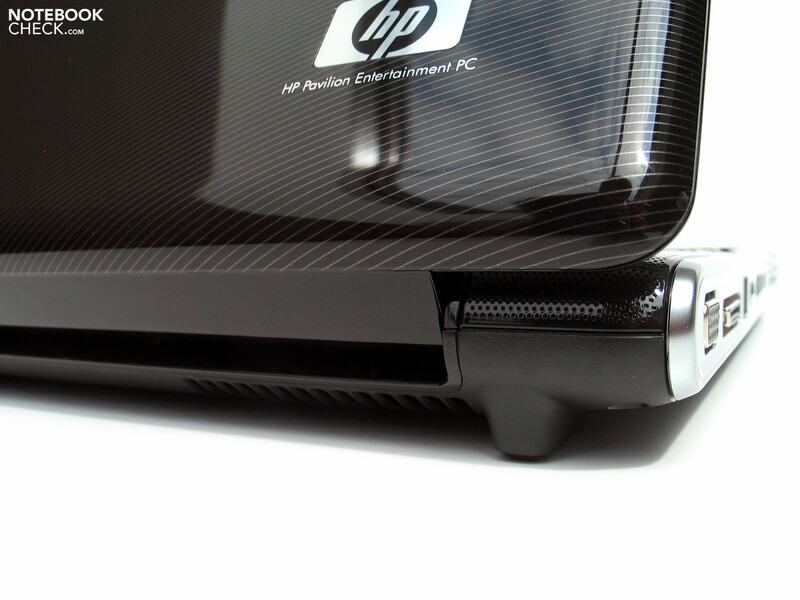 All in all, a majority of the HP dv6's ports are offered on the left side of the case, where there are also an interface for the docking port, a HDMI output , and a combined USB/eSATA port. This is a very good port configuration together with the remaining ports, considering the device's price category. A gigabit ethernet module by Realtek (Realtek RTL8168D/8111D) on the one side, and a wireless LAN module by Atheros (AR9285 802.11b/g) on the other side are among the built in communication features. Bluetooth can be included in the package of better equipped models, too. However, all share a webcam integrated in the display's frame, as well as high-class loudspeakers by Altec Lansing. In turn, one has to dig deeper into one's pockets (i.e. getting a more expensive model) for a built in TV tuner. The warranty always amounts to 24 months of manufacturer's guarantee with pick up and return service in case of a defect, whichever model one decides on. Although the dv6's keyboard comes in black, it does feel very sticky, as on the HDX, which is due to the lacquered surface. As long as one is "blessed" with constantly dry hands, this is less of a problem, but one will judder across the very slippery surfaces clumsily anyway during the warm summer months. This especially applies to the touch pad, more on that later though. The key's size turns out predominantly pleasant. Only the arrow keys apparently absolutely had to close ranks to the height of a single row of keys due to artistic reasons. This is not a problem as long as one does not need them too often, but they are rather unfit for controlling a computer game. Here, one can fortunately resort to the numeric block offered as well, which also finds place in the case without problems - rather unusual for this format. 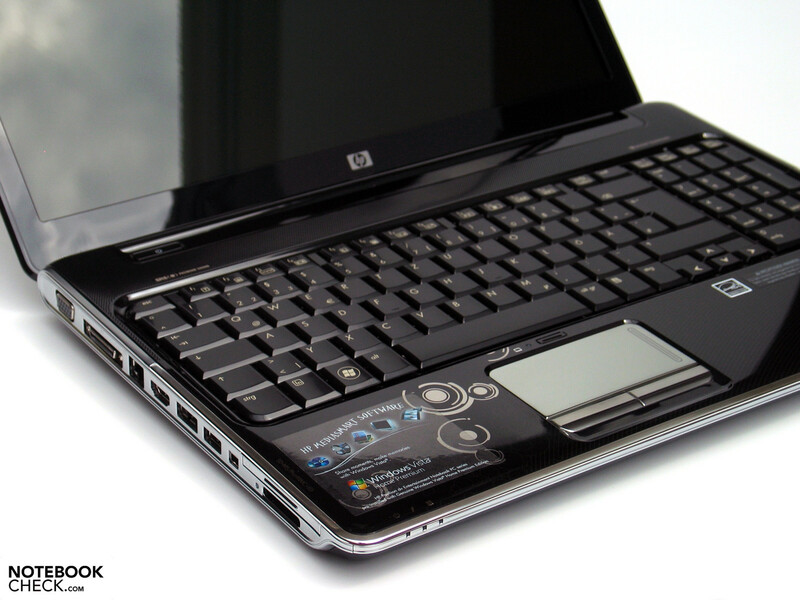 Since it does not impair the standard keyboard in its dimensions, this has to be seen as a plus of the HP dv6 by all means. 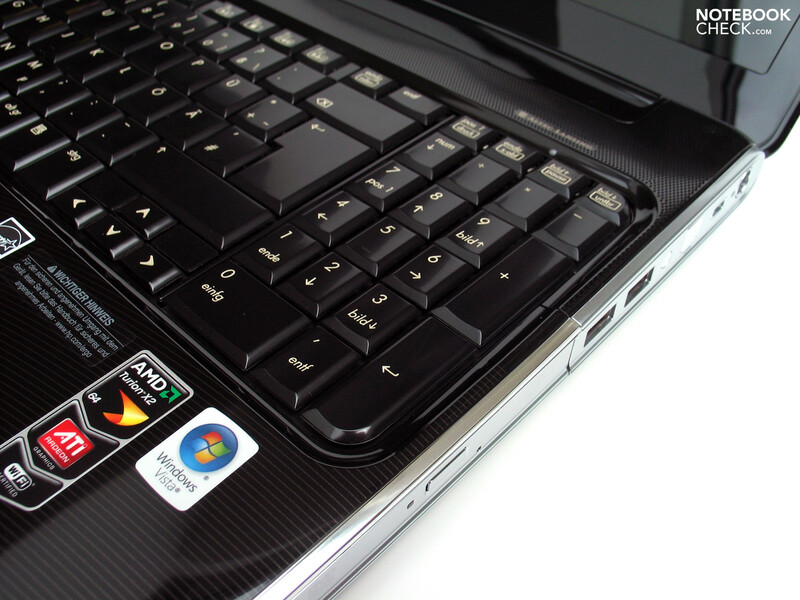 The feeling when typing with the notebook has to be described as rather soft with unobtrusive, quiet clicking sounds. If one hits the keys somewhat more vigorously, some bouncing can occur, since the keyboard unit partly sags a little bit. Thanks to the keys' size and the classic layout, there were practically no blunders during our test though. However, we have to criticize the touch pad. A sticky, slick surface with a mirrored look just is a no-go for an input device you use for tapping on with your fingers. Not only is the handling very unpleasant, but the look also quickly suffers from the accumulated traces of grease on the pad. Positive: an own button for deactivating the touch pad. 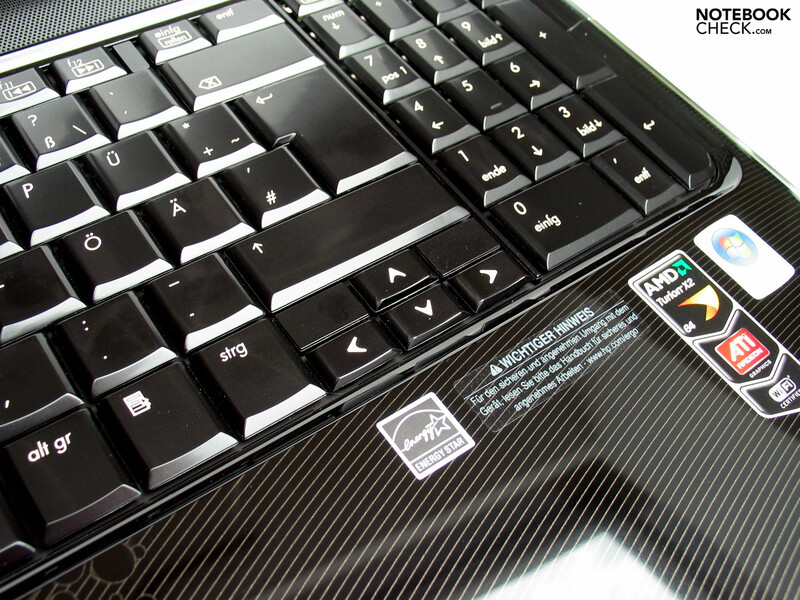 The touch sensitive additional keys respond without any problem, as on the already tested Pavilion HDX16, at least as long as they are pressed pointedly and not too shortly. The HP dv6 features a 15.6" display with a resolution of 1366x767 pixels (16:9 HD format) in all variants of equipment. 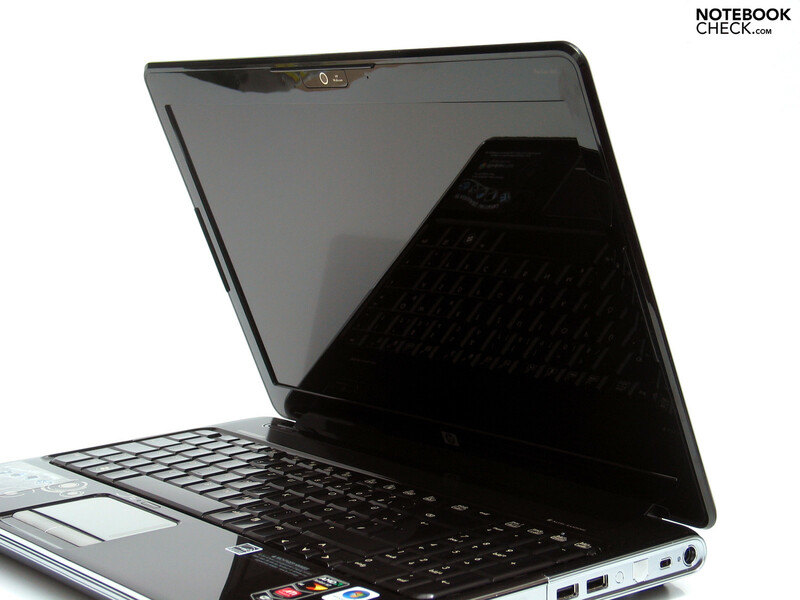 The "BrightView Display", as HP calls it, shows a reflective surface, which has unfortunately become standard for consumer-notebooks by now. However, the panel's measurement results partly turn out quite passable, e.g., the maximal brightness of 203 cd/m² of the used LG display (LP156WH1-TLA3) e.g is quite alright for a beginner's consumer notebook. The decline in brightness in the areas of the corners of the display to a minimum of 163.0 cd/m² does also not remain concealed from our measuring device. This results in an average illumination of 80.3%. The featured display's depiction of colors is to be described as subjectively good, although reflections have to be taken into account in almost all modes of application. These could even be observed indoors at mediocre lighting conditions, which means that usage of the notebook outdoors practically becomes untenable. The reflections are also permanently present when testing the stability of the viewing angle. Disturbing reflections already have to be expected at a small deviation from the ideal, perpendicular angle of viewing, both in the vertical and horizontal field of vision. Additionally, one also notes an early and swift change of colors along the vertical visual axis. 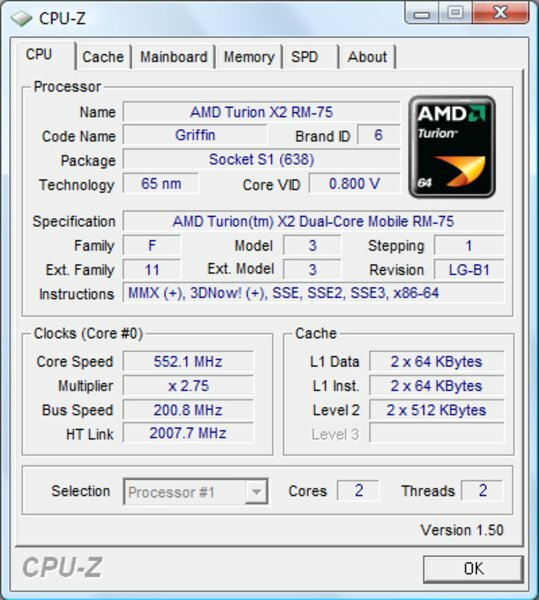 If one browses among the other current models of the same series, one also finds a whole range of different CPUs, by AMD as well as by Intel. 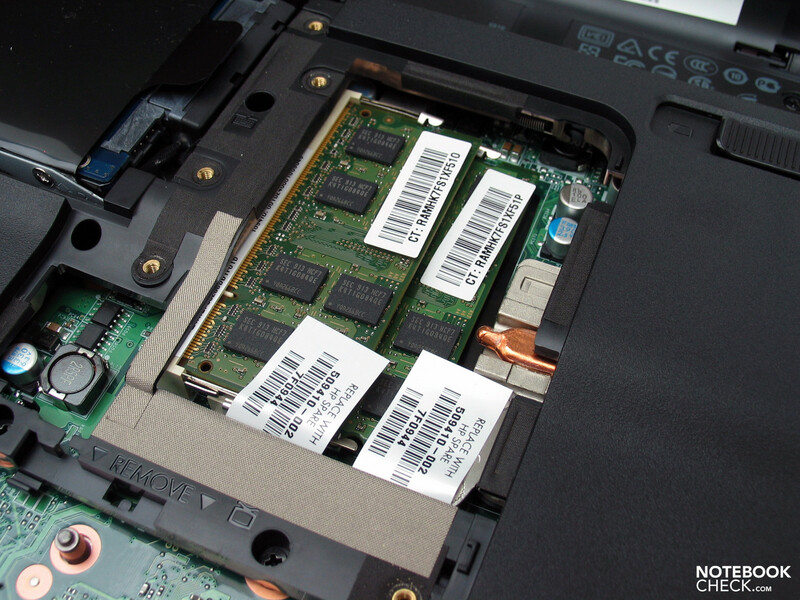 The Core 2 Duo P8600 processor by Intel with 2.4 Ghz is among the series' most powerful chips. You can find detailed information about the performance capability of the offered processors in our mobile processors' benchmark list. 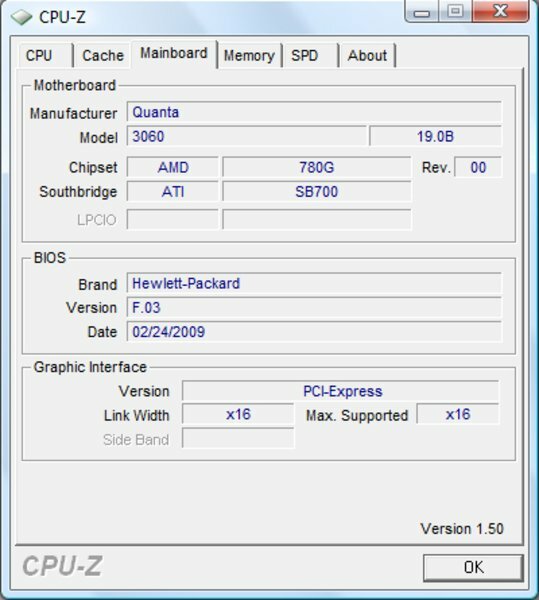 But HP also has ready an exciting option in terms of the used graphics card: besides the ATI HD 4530 featured in our test model, a HD 4650 (which e.g. already got to prove itself in our review of the mySN MG6) is offered in the models of higher value. This graphics chip positions itself between the Geforce 9600M GT and the 9800M GS, depending on the benchmark or game, and thus clearly leaves behind the competition by Nvidia in terms of price and performance. 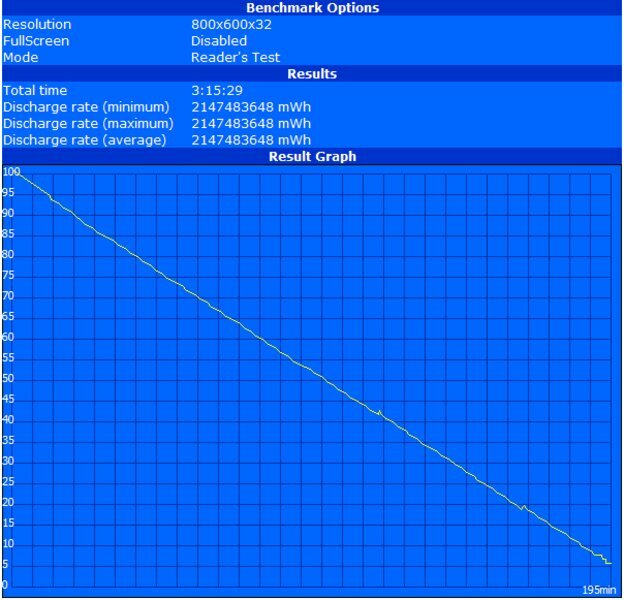 The benchmarks conducted with our test model show that the HD 4530 is not at all to be disregarded completely (at least for less demanding games). However, the result of 2902 points in the 3D Mark 2006 test comes off rather modestly. Viable results could also only partly be racked up in the practical game tests conducted. The notebook reached an average frame rate of 79.8 fps on minimal graphics requirements (800x600, all settings switched off/minimum) when sample-playing the scary shooter FEAR 2. The results are on the border of smooth depiction with medium graphic details (1024x768, all settings switched on/medium, 2xAA): 29.7 fps. An almost identical picture was presented in the tests of Call of Duty 4 and Racedriver GRID. While the games run without problems on low graphics requirements, heightened graphic details quickly lead to a sharp decline of performance. Only World of Warcraft was playable more or less well at an average of 45.7 fps even with medium graphic details (1024x768, all settings switched on/medium). 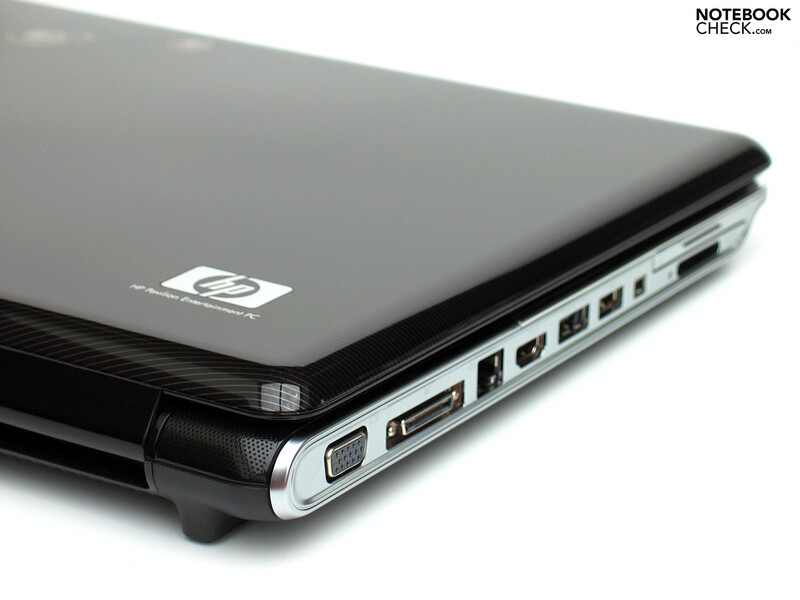 HP adorns itself in terms of the dv6-devices' equipment with proud 4GB of system memory (DDR 2) in all configurations. However, there is a snag to it: these cannot fully be used with Windows, since only a 32-bit version of Windows Vista Home Premium is implemented. This is also partly reflected by the only meager result in the PCMark 2005 benchmark test. 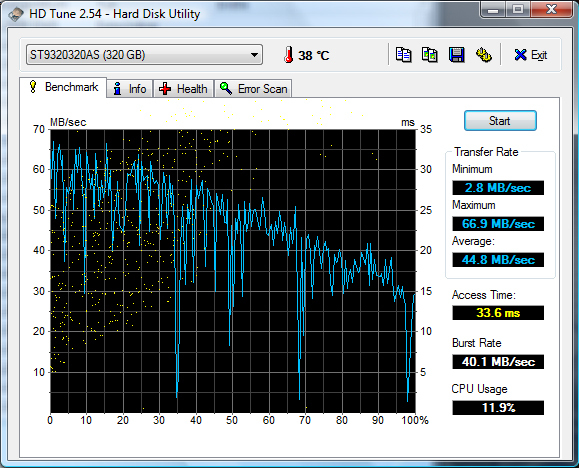 Obviously, HP also considered capacity (320GB gross) more important than performance as far as the hard disk is concerned. In spite of several attempts and the deactivation of possibly influencing software, the used hard disk only reached modest transfer rates of averagely 44.8 MB/sec, and unusually long 33.6 miliseconds for access time. Since these values have to be seen as anomalies, we can however not rule out a possibly existing defect of our test device. 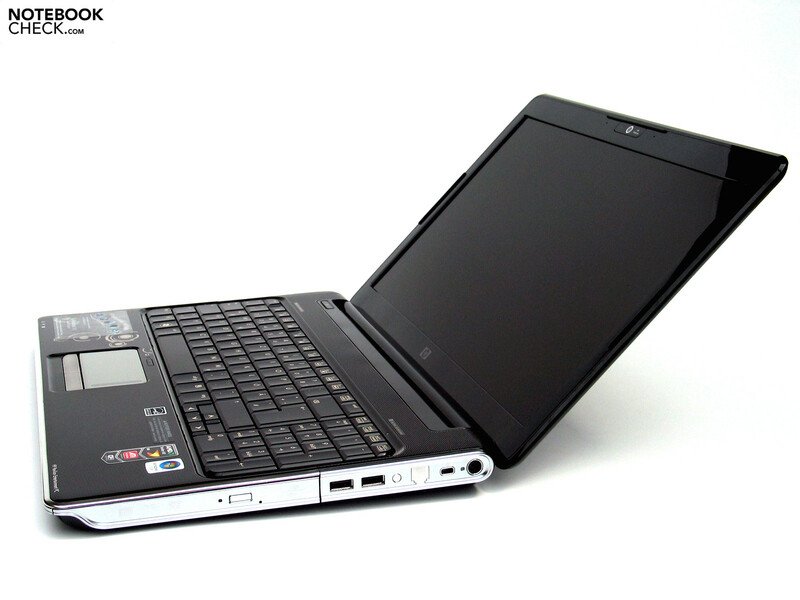 Due to the dv6-1199eg's observed reserve capacities, we would at least have wished for a pleasant, quiet operating of the notebook, but there could be no talk of it in the test. Our test model's vent ran permanently even when idling without load, and it was always present and also subjectively considerably audible at 38.8 dB(A). The hard disk's clicking was also audible, but could not be measured in consequence of the vent's comparably high volume. The vent again moved up a gear under load and reached up to 43.7 repectively 44.8 dB(A). However, the permantly busy fan managed keeping the case somewhat cool. We could measure a maximum of up to 36.6 °C on the notebook's top, whereas the palm rest even stayed very cool with only up to 28.7 °C. The heating on the bottom side came off only a bit higher than on top of the base unit, and the highest temperature of 39.2 °C could be observed in the area of the fan. (±) The average temperature for the upper side under maximal load is 32.7 °C / 91 F, compared to the average of 30.9 °C / 88 F for the devices in the class Multimedia. (+) The maximum temperature on the upper side is 36.6 °C / 98 F, compared to the average of 36.5 °C / 98 F, ranging from 21.1 to 71 °C for the class Multimedia. 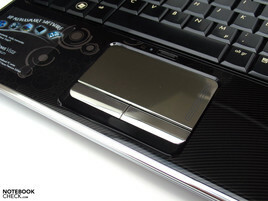 (±) The average temperature of the palmrest area of similar devices was 29.1 °C / 84.4 F (-1.3 °C / -2.3 F). The Pavilion dv6 can also resort to high-class loudspeakers by Altec Lansing. 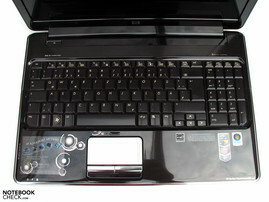 Placed on the left and right above the keyboard, their sound albeit has to be differentiated clearly from those of the HDX16 models. For instance, the lack of a subwoofer becomes obvious. The loudspeakers' sound is somewhat treble-heavy, but clear and very present. The best sound result is achieved at medium volume, here the playback of music is also imaginable by all means. 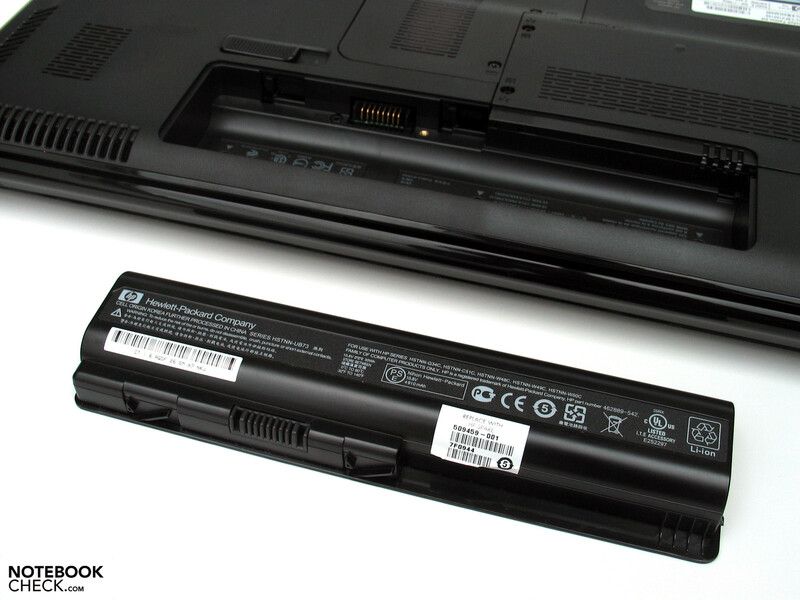 The featured battery's capacity comes off ordinarily with 55 Wh (10.8V 4910 mAh), while the used component's consumption of electricity has to be described as rather above-average. Neither the featured CPU, nor the graphics card are among the most frugal chips. 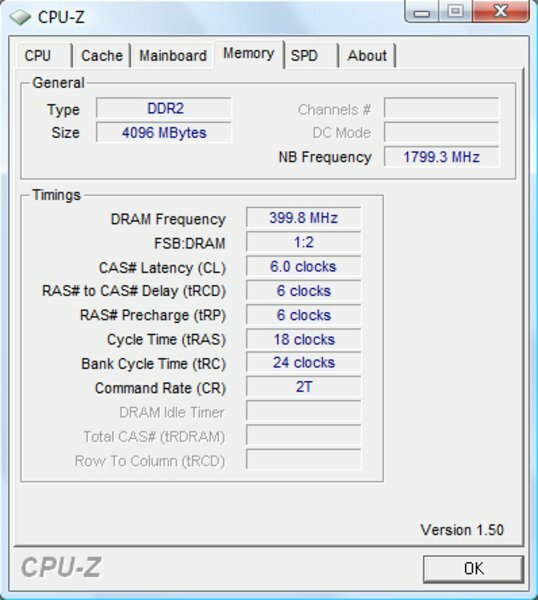 They even drain quite a lot of power compared to the performance offered. 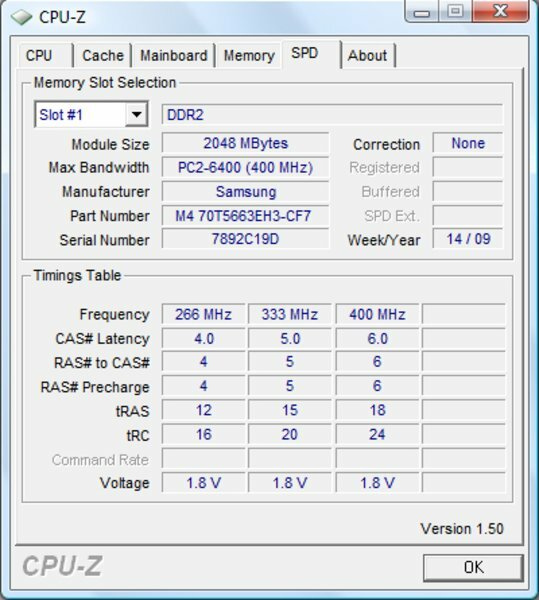 Under load, the dv6-1199eg even reaches as much as 82.3W. Hence, the battery life of 45 minutes in the BatteryEater Classic Test (Highest performance profile, max. brightness, load) are not much of a surprise. With maximal energy saving options (min. display brightness, WLAN switched off, energy saver profile), the notebook reaches 195 minutes in the BatteryEater Readers Test at the most. For practical usage, one can be geared to the battery life while surfing via WLAN, which however comes off just as modest with 130 minutes in the test. The battery life for DVD playback is indeed problematic with only 95 minutes in the test (max, brightness, balanced profile). 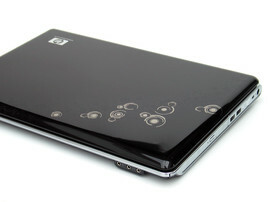 The new dv6 series' spectrum in terms of equipment reaches from the low-price multimedia-beginner (to which the 1199eg model at hand would have to be numbered among) up to reasonably priced middle class notebooks, which will meet a large interested audience, thanks to their positioning below the mark of 1000 euros. 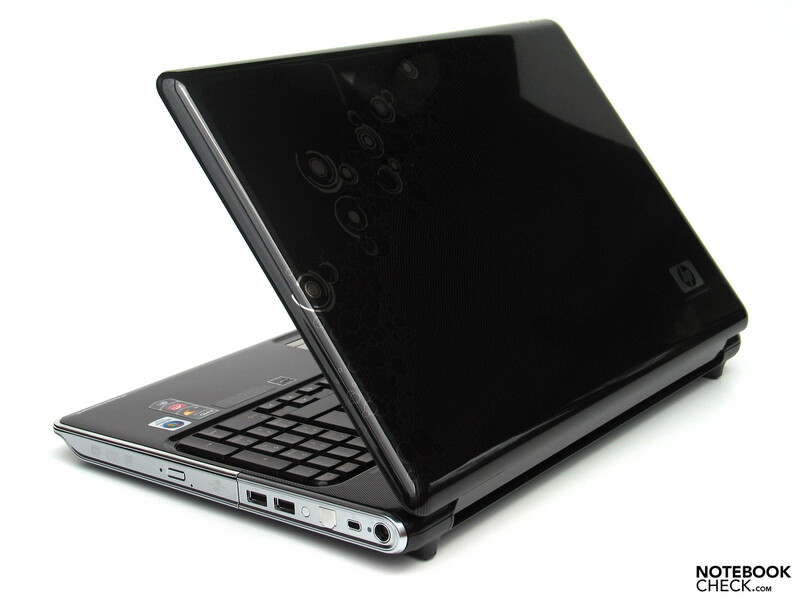 The models of higher value are also definitely to be seen as competition to the HDX16 series, which comes in an almost identical case. 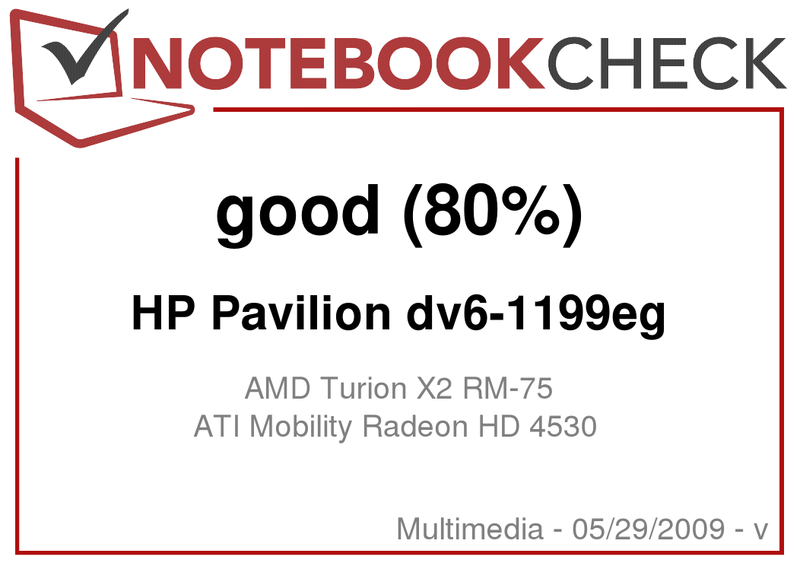 Apart from the full HD display, they also remain within reach of the P8600 CPU and the ATI HD 4650 graphics card (at the moment the dv6 series' strongest possible combination) in terms of performance. One should definitely get this equipment when having an ambition towards computer games. 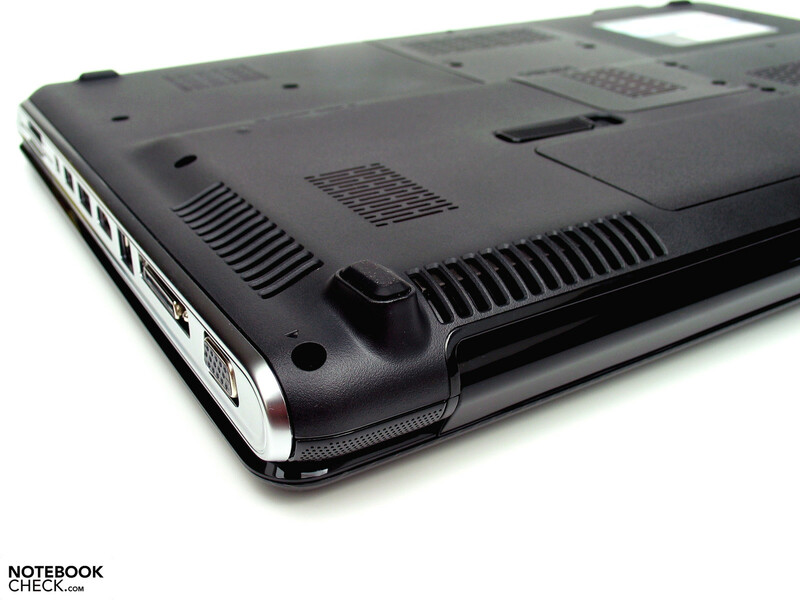 The dv6 can, like the HDX16, also score with an especially ample configuration of ports. 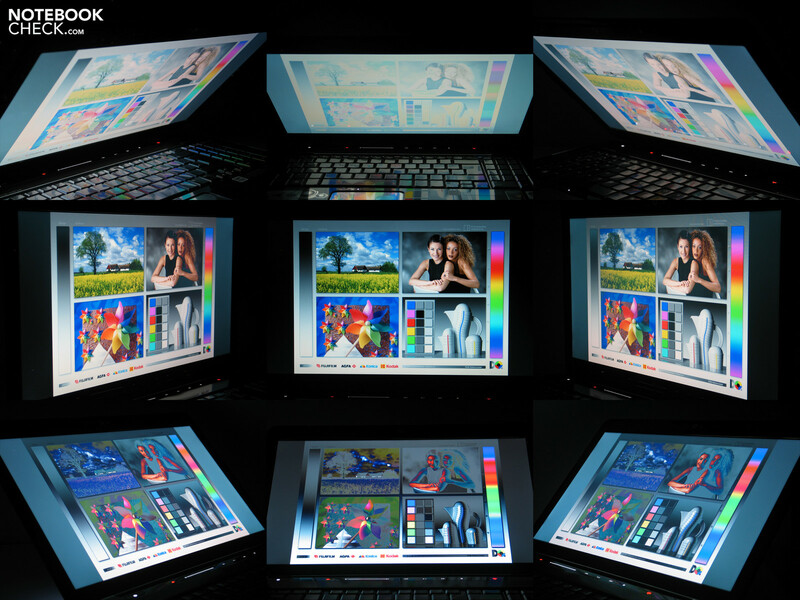 However, one meets the same sticky, high-gloss surfaces, as far as the input devices are concerned, only in different colors. Here, the mirrored touch pad has to be seen as the peak of artistic proliferation. The display features a resolution of 1366x768 pixels in the 16:9 HD format, but one has to come to terms with the specular surface, which can lead to disturbing reflections indoors as well. 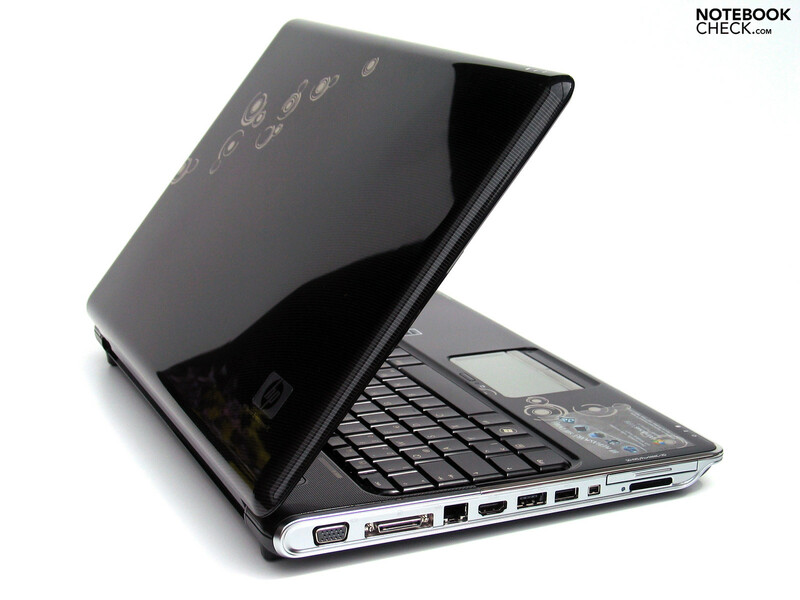 The dv6-1199eg's soundscape will also definitely take some getting used to, as the fan is permanently running even without load, whereby the notebook is always present to the ear. The surface's temperatures albeit always stay within a carefree scope. The notebook's battery life is also somewhat stingy for our taste. While one can still think of practical usage with a little over two hours during WLAN operating and surfing, the 1.5 hours for DVD playback come off very narrowly. Altogether, the dv6-1199eg offers a good total package for those multimedia-beginners who have low demands but are oriented towards design. 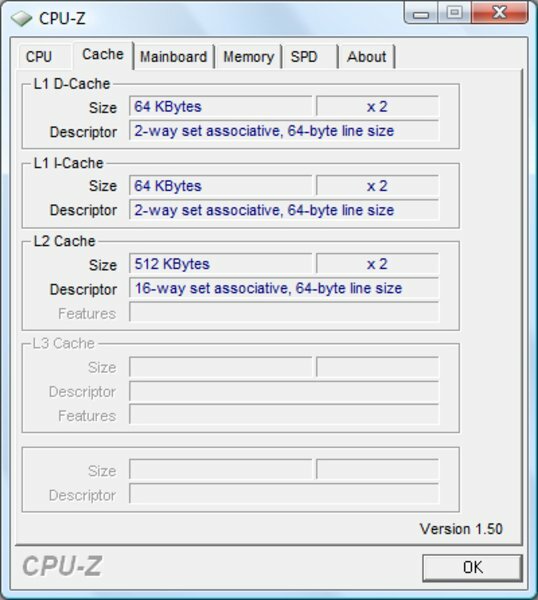 More ambitious users should rather get a more powerful variant in order to be able to enjoy the one or other computer game. Thanks a lot to the company Notebook.de, which kindly placed the test device at our disposal. You can configure the device here, and also buy it. Positive: despite the numeric block, the single keys' size comes off well. 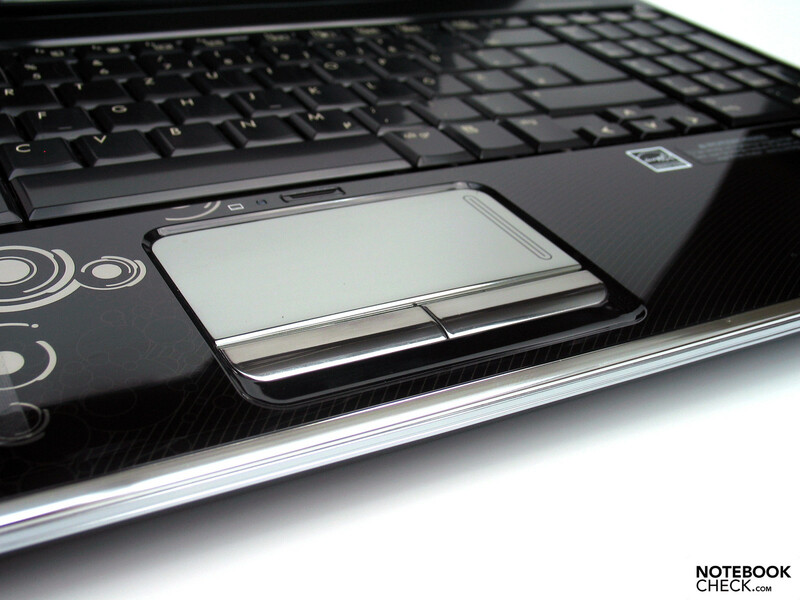 The mirrored touch pad is inacceptable, it quickly becomes polluted and has bad gliding abilities. 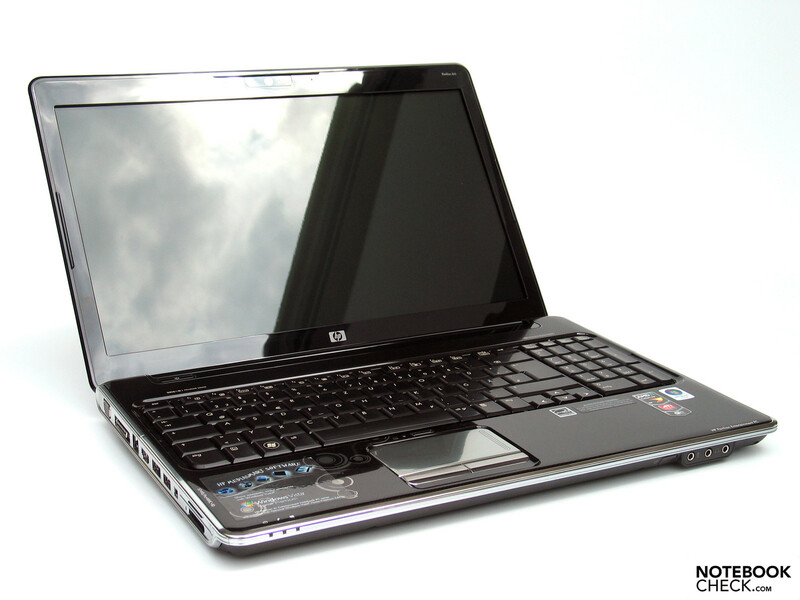 The beginner's model 1199eg of the HP dv6 series includes components by AMD and ATI. 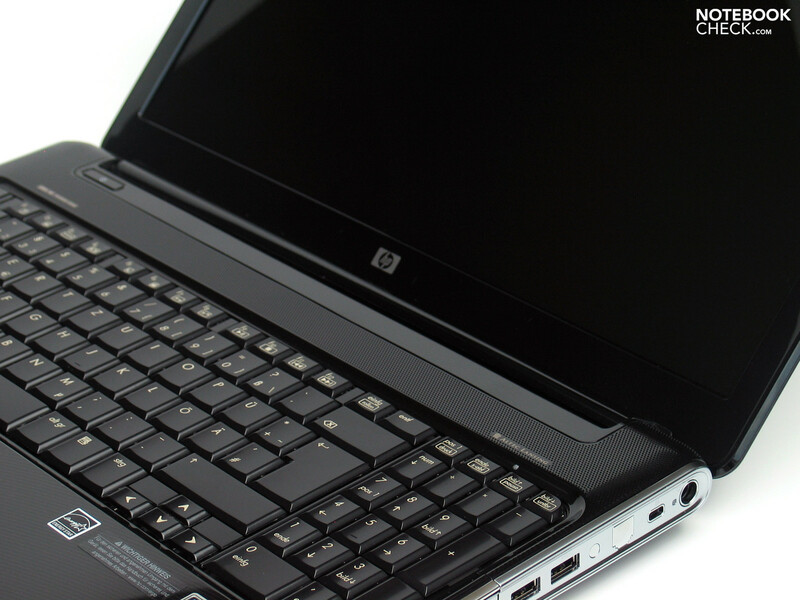 It also features 4GB system memory (DDR2), as do all other model variants. ... the used fan is running permanently and is well audible. ... but they cannot keep up with the HDX16's sound system at all. 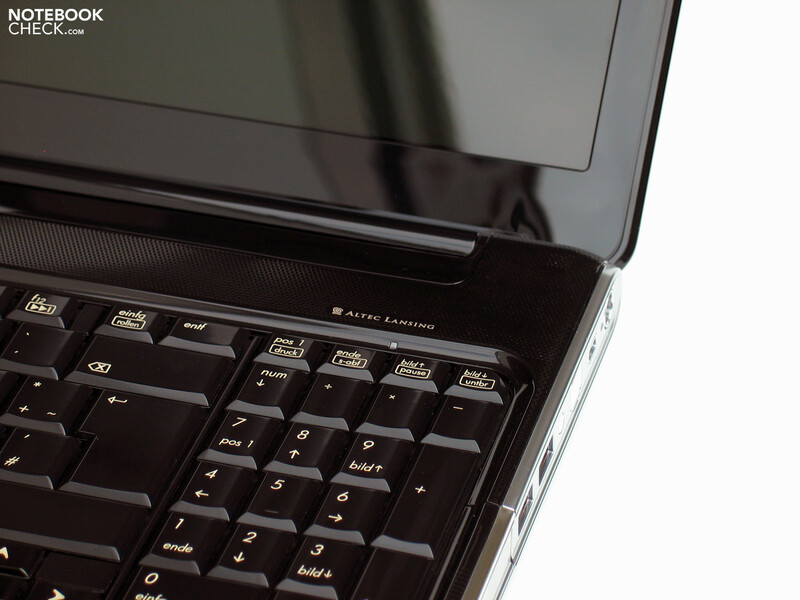 ... it does show the same sticky surface as the HDX16 series already did, which takes a lot of getting used to. A glare-type panel of course is "mandatory" as well for a representative of the classic multimedia-genre. ... but are furnished with an even more effective lacquer. Both notebook series share the "imprint" lacquering, which displays different ornaments and is finished with a high-gloss surface. This indeed appears very impressive optically, but the surfaces feel somewhat sticky. 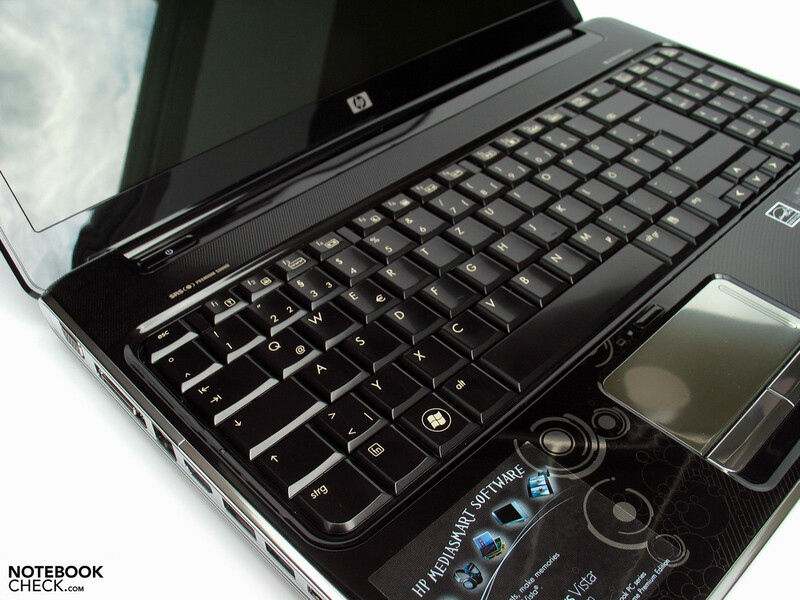 The build quality, as well as the case's stability come off rather averagely, as in the HDX16. ... which even comes off especially generously in more low-priced models. 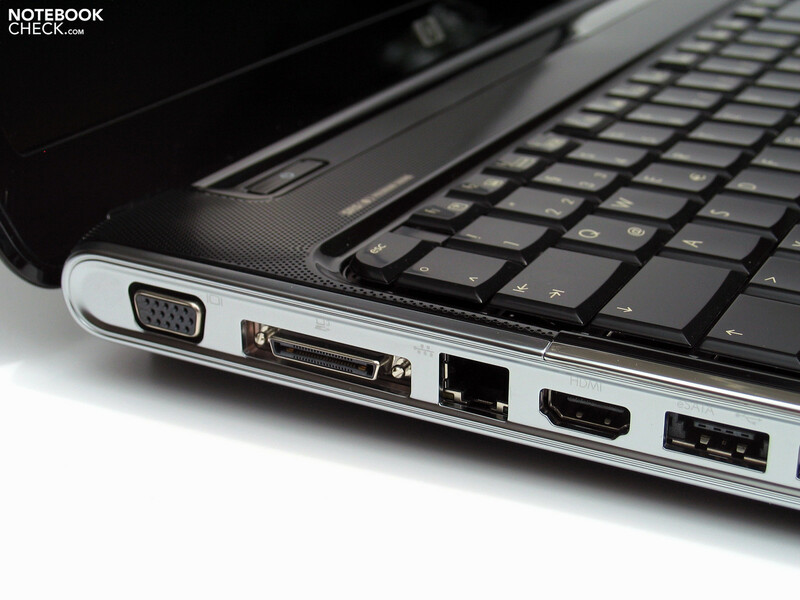 For instance, expansion port, HDMI, and eSATA ports are offered. Ultimately, the battery life of about 2 hours in WLAN operating also comes off only averagely. The price/performance-ratio. 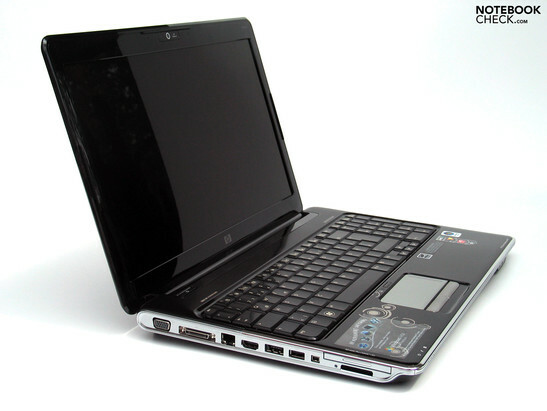 One gets a comparatively well-equipped multimedia device for less than 600 Euros. 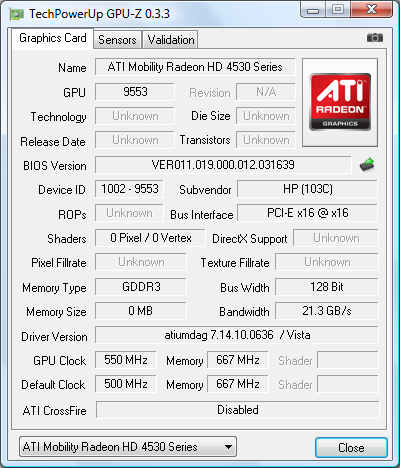 The ATI Mobility HD 4650 graphics card, which is only available in models of higher value, but is definitely recommendable for games. 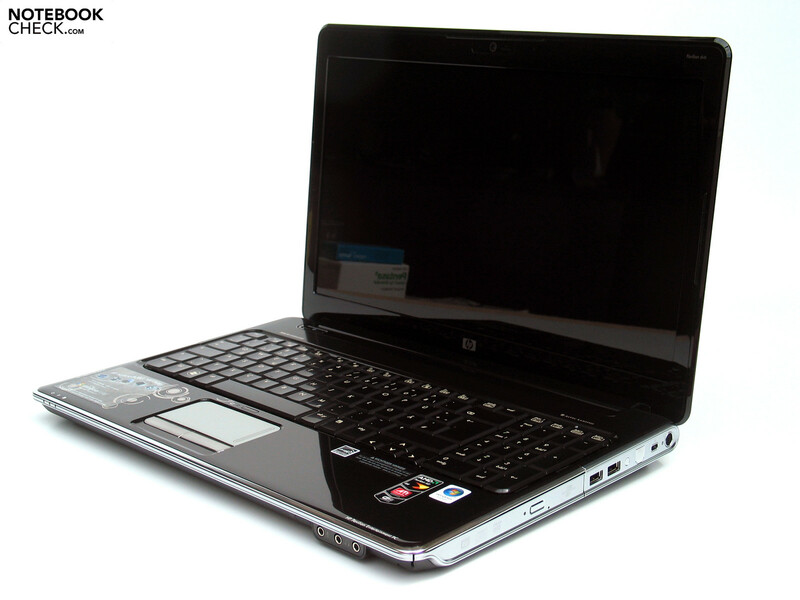 Definitely: the similarity of the case's lacquering to the HDX16, which is twice as expensive. A different lacquering does by far not make a better or worse case. Multimedia-beginner from all brands, first and foremost Acer: Aspire 6530G, 6930G,… but also Toshiba with the A300.